A new survey has been launched today by the North Hertfordshire Community Safety Partnership (NHCSP), to identify resident's concerns about community safety matters in the district. The survey invites residents to comment on crime, disorder and nuisance issues in their neighbourhood. Answers given will assist the partnership in prioritising resources and will also be used to inform and create a new Community Safety Action Plan for the district. The survey is completely anonymous and only takes a few minutes to complete. The closing date for the online survey is Sunday 10 March. NHCSP is made up of a number of different organisations including North Hertfordshire District Council (NHDC), Hertfordshire Police, Hertfordshire Fire and Rescue Service, Probation Services, NHS and other public, private and voluntary organisations who all work together to make the district a safer place for all. Cllr Tony Hunter, NHDC’s Executive Member for Community Engagement said: "North Hertfordshire is a safe place to live, however we want residents to let us know about any safety concerns they have in their local community, so that they can be addressed. The survey only takes a few minutes to fill in and responses will feed in to the new action plan, which will help make our district a safer place to live and work." 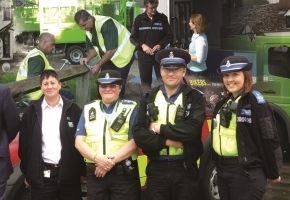 Chief Inspector Sally Phillips from Hertfordshire Police said: "We rely on the public to be our eyes and ears so we need them to tell us if there are any issues, such as hotspots for anti-social behaviour, that we need to know about. We can then create solutions by working in close partnership with other organisations in the NHCSP, such as North Hertfordshire District Council. By taking the time to fill out the survey, residents will undoubtedly have a positive and far-reaching impact on their communities."